Driver Alcohol Detection System from National Highway Traffic Safety Administration. Built-In Car Breathalyzers Have Been a Good Idea for Years. They’re Still Not Ready. 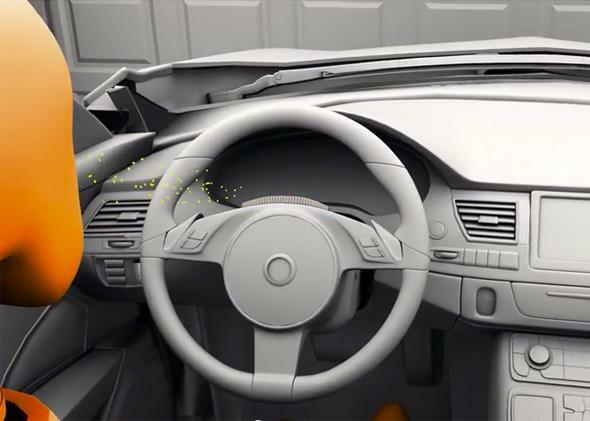 A steering wheel sensor could use a driver’s natural exhale to calculate blood alcohol content. Last week, the Department of Transportation presented research into two built-in blood alcohol content sensors for cars. Ten thousand people are still killed by drunk drivers every year, and the DOT hopes that placing a breathalyzer in steering wheels and adding an infrared skin scanner on dashboards will create a reliable framework for ensuring that someone who is intoxicated can’t start a car. In 2008 the Driver Alcohol Detection System for Safety began exploring existing breathalyzer technology and building prototypes to detect whether a driver’s blood alcohol content is over 0.8 percent, the legal limit in all 50 states. Created by the National Highway Traffic Safety Administration and the Automotive Coalition for Traffic Safety (an industry trade organization that includes virtually all major car brands), the DADSS worked to refine proof of concepts and essentially make the dream a reality. Six years later the group has made progress, but your new car won’t be checking how many beers you had with your friends any time soon. “It is literally possible that the epidemic of drunk driving could be solved where cars simply could not be operated by drunk drivers,” Chuck Hurley, the then-CEO of Mothers Against Drunk Driving, told USA Today in 2006. By 2007, Nissan said it was developing a built-in breathalyzer for its cars. At this time, drunk-driving reduction technology was mainly just ignition interlock devices—typical clunky breathalyzers afixed to dashboards that could lock down the ignition sequence if someone tried to drive drunk. The DADSS research has certainly improved on this technology. The prototypes work in the background to measure blood alcohol content from a driver’s touch and natural exhales—there’s no emptying your lungs into a tube. The system would also be a voluntary safety feature in cars, not mandatory. And the group says that its sensors are more accurate and reliable than anything developed previously. When asked about ways to trick the system, like a drunk driver asking a sober friend to sit in their car and turn it on before switching out, the National Highway Traffic Safety Administration simply said that DADSS is doing research into tampering and that the system will be able to differentiate between passengers and the driver. And what about safety in emergency situations, like when someone who is drunk is in immediate physical danger and wants to flee their assailant? The administration said that the group is researching an emergency override option that could exist without undermining the premise of the system. In 2009, Time asked “Coming Soon: A Breathalyzer in Every Car?” But at this rate, driverless cars could solve the problem first.